Will Xtranormal return? Here are three alternatives for now! 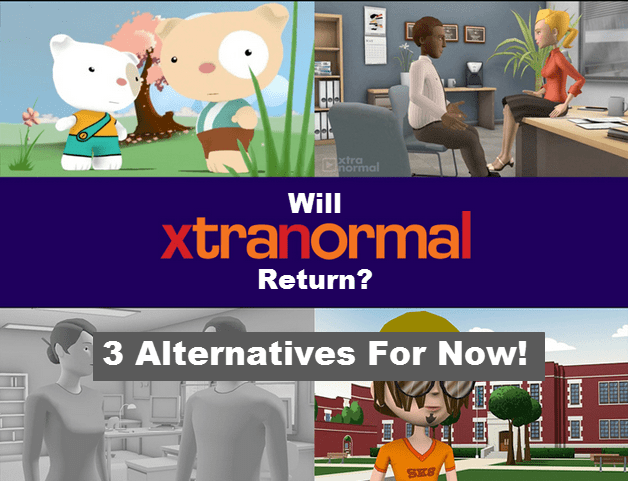 xtranormal.com was recently acquired by nawmal, ltd.
Voki is a free avatar speaking program that allow you to create 60 second clips from various types of audio sources. For educators, there is Voki Classroom for only $29.95 a year for longer clips, more avatars, and other special options for the classroom. They recently added a new feature, Voki Presenter that has unlimited length records but doesn’t have the classroom management side of Voki Classroom for $29.95. You can get an account with both for $49.95 a year. Don’t just wait around and wonder if Xtranormal will return. Start exploring new tools today. What are some of your favorite tools in this category? Try different one. But Xtranormal will still Nawmal, Ltd. And Xtranormal will return soon. wonder if Xtranormal was ‘pulled’ down because it had been sold too cheaply and so the customers who had paid for xtranormal had to be fraudulently dumped? $495 per year is the cost of nawmal, when xtranormal was costing a $20 one off payment. I knew Xtranorml cost way too little; I just didn’t ex[pect it to fold as quickly as it did.